Ski touring is a type of skiing which takes place in unmarked and unpatroled areas outside a ski resort. Also known as backcountry skiing (mostly in the United States), it’s a challenging and physically demanding form of skiing, as well as a great way of exploring remote mountain areas and being in deep contact with nature. Instead of using ski lifts or other means of transportation, ski touring involves going uphill using skins, a piece of fabric attached to the base of skis to prevent them from sliding back when climbing up a slope. Before skiing downhill, skins are removed. Depending on the terrain, sometimes you may need to use ski crampons and carry the skis on your back. Ski touring is more about the uphill ―going off-the-beaten-tracks and away from crowds, enjoying rewarding views after an intense physical effort― than the downhill. However, descents involve the thrill of skiing on fresh tracks. Usually, trips can range from one day activity to a several-day ski traverse. Multi-day ski touring trips involve spending the night in tents or in mountain huts. When the trip consists on staying each night on a different mountain hut, it’s called hut-to-hut skiing. Ski touring in Triglav National Park, Slovenia. Photo: Gregor Kofler. Those who want to try ski touring should be physically fit, in order to enjoy this activity to the fullest. Besides, they need to have a solid off-piste skiing experience and be able to deal with different types of snow. Of course, it’s always possible (and recommended) to hire a guide for a ski touring course if you don’t have much experience in off-piste terrain. Skiing in the backcountry involves being exposed to avalanche risks and other hazards like crevasses or falls. It’s essential to plan your ski touring adventure carefully, considering weather and snow conditions. Also, it’s key to carry safety equipment and be prepared to act effectively in an emergency. When is the Best Time to Go Ski Touring? Skiing down to the sea in Finnmark, Norway. Photo: Fred Buttard. Ski touring can be practiced either in winter or spring, depending on your skills and preferences. Spring usually offers amazing snow conditions for ski tourers, due to the presence of corn snow, a type of snow with a crusty surface, which melts and refreezes on a daily basis. Corn snow is quite easy and enjoyable to ski, although you have to watch out for the best time of the day to ski (preferably in the morning and late afternoon). Besides providing a more stable type of snow, spring has longer days (which means more ski touring hours!) and a warmer weather. The winter season, on the other hand, increases the chances of finding powder snow, the ultimate desire of skiers. Cold temperatures, no wind and consistent snowfall are the best allies for this fresh and ultra light snow, that makes skiers and snowboarders feel like floating. However, riding on deep powder is not an easy undertaking and it’s only recommended for skilled skiers. Ski touring equipment. Photo: Michael Horst. 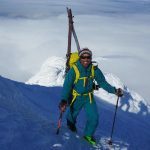 Why Should you Hire a Guide for a Ski Touring Trip? Ski touring in the island of Rishiri, Japan. Photo: Toshiya Watanabe. Venturing into the backcountry is an exhilarating experience that opens a whole new array of opportunities to skiers. However, mountain environments can be rather unpredictable and involve a series of risks that should be taken seriously. On the first place, a general rule: don’t go off-piste alone. Secondly, go with a certified mountain guide if possible, especially if you don’t have much off-piste experience or you are not familiar with the area. 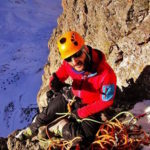 A certified mountain guide has an expert knowledge of the terrain and the usual weather conditions. Based on their daily monitoring of snow ―along with your level of skills and experience― they are able to choose the best locations for your trip. That way, you’ll make the most of your time. 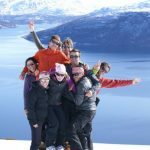 Moreover, going on a ski touring trip with a guide can help you boost your skills in the backcountry terrain and reach new levels of expertise. Carros de Foc ski traverse in the Spanish Pyrenees. Photo: Jordi Tosas. 1| Chamonix-Zermatt Haute Route. Joining France and Switzerland, this is the most classic ski traverse in the world. It takes between 5 to 8 days to complete it and you can stay in different mountain huts along the way. 2| Whistler, Canada. This mountain village in British Columbia is a first-class ski touring destination in North America. Venture into the wild and enjoy untouched powder snow! 3| Finmark, Norway. In the northeast of the country, this land of mountains and fjords allows the fascinating experience of skiing down to the sea! 4| Carros de Foc, Spain. An iconic ski touring traverse in the Spanish Pyrenees. Enjoy 5 days on this legendary route inside Aigüestortes i Estany de Sant Maurici National Park. 5| Westfjords, Iceland. This isolated land in the Arctic Ocean makes one of the most unique ski touring experiences in the world. Sailing boats can take you to the best spots. Ski touring in Georgia. Photo: Ilia Berulava. 6| Triglav National Park, Slovenia. Enjoy amazing runs off-the-beaten-tracks in this national park at the heart of the Slovenian Julian Alps. 7| Utah, United States. The Wasatch Mountains are the perfect scenery for a backcountry skiing adventure! 8| Gudauri, Georgia. The surroundings of this ski resort in the Caucasus Mountains await with challenging slopes! 9| Rishiri Island, Japan. This isolated land off the northern coast of Hokkaido is a paradise for backcountry skiers and provides an authentic Japanese experience! 10| Sapporo, Japan. Famous for its heavy snowfalls, the island of Hokkaido is a synonym of deep powder skiing! Sapporo is the best starting point to explore this wonderful area.